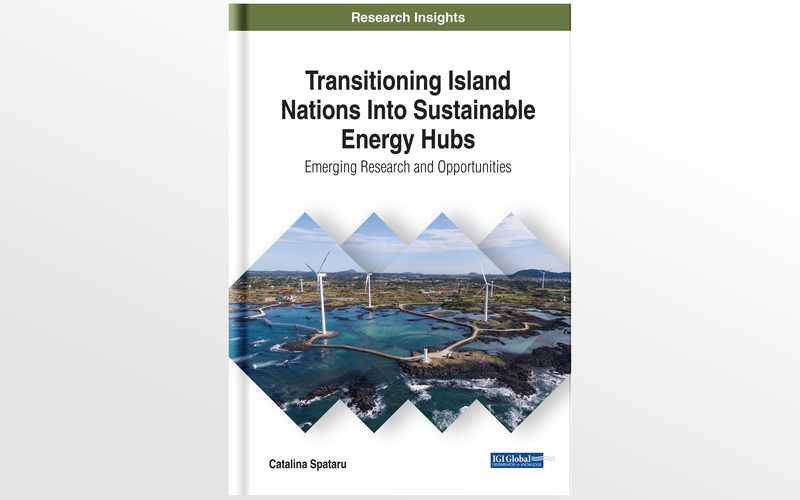 Dr Catalina Spataru’s latest book exploring the theoretical and practical aspects of establishing renewable energy source systems on islands has been published by IGI Global this month. In the book, 'Transitioning Island Nations Into Sustainable Energy Hubs: Emerging Research and Opportunity', Dr Spataru shows that islands represent great opportunity for demonstrating energy solutions, offering various advantages as laboratory for studying renewable energy sources. In the same time islands can be a great source for export to mainland or other neighbouring islands and countries. It provides an understanding of current status in islands worldwide and potential future solutions with several examples assessing the technical and economic potential. It creates an inventory of existing information and recent research, and compiling a comprehensive guide, providing a baseline understanding of developments and challenges on islands. The book is essential reading for researchers, policymakers, professionals, students and so on, who are interested in the area of energy systems, sustainability, islands. It provides an interdisciplinary approach and insights to current research and opportunities and into the type of changes needs to be made to make islands the “energy hubs” of the future, the “hottest energy centred points”, the “golden spots” for sustainability. Dr Spataru argues that there is an urgent need to create an inventory of existing information and recent research, and compiling a comprehensive guide, to provide a baseline understanding of developments and challenges on islands worldwide, and a need for sharing practices and innovative solutions. “Islands are facing challenging times and are among the most vulnerable to climate change. Even today many of the islands have considerable energy supply problems and relies on oil-based power generation. On the other hand, due to their diverse characteristics, islands could be excellent demonstration sites and vehicle for diffusion of innovative energy solutions that can effectively replace the conventional methods”. Dr Catalina Spataru is an Associate Professor at UCL Energy Institute and Course Director of MRes Energy Demand Studies. Her expertise is in whole energy system dynamics and resource nexus. Her activities range from theoretical investigations to implementation research and the development of mathematical models. She is the author of the books Whole Energy System Dynamics: Theory, modelling and policy and Transitioning Island Nations into Sustainable Energy Hubs: Emerging Research and Opportunities , and co-editor of the Routledge Handbook of the Resource Nexus. She has participated and lead numerous research and consultancy projects funded by industry and research councils. Topics focused on urban development, technologies for decarbonisation, sustainability goals, cities, islands, infrastructure, energy networks, resource efficiency. She teaches Smart Energy Systems Module, Metrics, Modelling and Visualisation of the Resource Nexus Module and Communication Skills, providing students with an understanding of the methods, concepts and practice of whole energy systems, offering a combination of theory, modelling interactive exercises and case studies. She is the regional representative of the IEEE Women in Power (Region 8 – Europe).